FARMINGTON – Throughout ecclesiastical history, malcontents and publicists have been nailing stuff to church doors. Around 1036ad, Earl Godwine’s ruffians in England famously tacked the skin of a flayed Danish pillager to a church door to send the message, "Piracy is discouraged around here." In Victorian times, foxes’ tails were affixed to church doors, and when yapping curs, attracted by the brushes, disrupted religious services within, an official dog whipper would earn his pay. The literary crowd has also been attracted by the directness of this methodology. Bertolt Brecht in The Caucasian Chalk Circle had a governor’s head nailed to a church door, while Arthur Miller, in The Crucible, was content with the mere threat of a confession being so affixed. Then there was the monk Martin Luther, of course, back in 1517, who posted 95 critical questions or theses to the door of the Castle Church in Wittenberg, which led to the founding of the Protestant religion, and, down the road, several thousand schisms, women ministers, gay bishops and stuff he never dreamt of. In fact, if Luther were alive today, and if he didn’t have a blog, you can bet he would keep Palmer Hardware busy with the sale of nails. 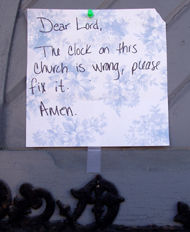 Dear Lord: The clock on this church is wrong, please fix it. Amen. And verily, raising one’s eyes to the top of the clock tower, one could ascertain at once that the clock was exactly one hour slow. As with most ills, the blame lies with the government which only gave a couple of years notice that Summer Time would take effect three weeks earlier in 2007. The clock’s mechanism is electronic, and when installed, was programmed to advance automatically one hour on the old schedule, rather than the new one. Thus for 21 long days Farmington has been chronometrically challenged. In the good old mechanical days, as this column has reported, John Oakley would solve almost all the town clock’s ills by climbing high into the tower and giving the iron framework a hearty smack with a two by four - an aspirin, if you will, for sticky gears and spindles. But not today, with the hoity-toity, electronic gizmo rigged up to the clock. And no doubt this piece of wizardry will put the town out of kilter again for a few weeks in the fall, when the clock changes back an hour. With the passing of Mr. Oakley, church officials only climb high into the clock tower these days very occasionally to change a light bulb. An unnamed and unsuspecting volunteer did so, in fact, just last month and was almost deafened when the clock struck two. He was luckier than Don Marble, though, who was once stuck up the tower as the clock boomed out the noontime hour. The Public Safety Building (PSB) is also in time-changing mode. Who can recall, back in 1987, when an All Male Review was staged by the building’s committee to raise $1,500 for vital repairs? Town opinion was cleaved in two. A couple of long-time firefighters, whose senses of propriety were deeply offended by the thought of scantily clad (if clad at all) male bodies gyrating in front of womenfolk, even quit the department. Now, fast forward 20 years to the PSB and Farmington Corner can reveal – Coming Soon: A Unisex Shower. Naturally its installation will be for the most respectable of reasons, and not merely as a recruiting tool for the fire and ambulance squads – but first, a little background. "The Farmington Wellness Committee," says an official note, "in looking for ways to try and reduce our ever-rising health costs, has established a fitness room for the town employees." The town’s insurers, Primex, sprung for $2,000 worth of gym equipment that has recently been installed, complete with carpeting, in the upper section of the PSB. Prior to work and during lunch, well-known town faces can bee seen pedaling and pumping and puffing away, shedding unwanted pounds and exuding trickles of perspiration. Space in the PSB is limited, and while a shower is desperately needed, if the public is to pay its taxes at the Municipal Building of an afternoon without a string of catty remarks, there is only room for one. Yes, the Unisex Shower, now making the All Male Review, in some conservative eyes, seem like a vicarage tea party by comparison. Fear not, say our town employee womenfolk. The door will have a lock, guards will be posted, and a can of Mace will be clipped to the shower wall within handy reach. That may well be, but personally, I’ll be surprised if this extremely controversial business doesn’t launch a whole series of diatribes tacked to the door of the First Congregational Church. Watch that space!